This Goldschläger decanter (a Goldschläger is a Swiss cinnamon schnapps) adds just the right amount of warmth to any room. 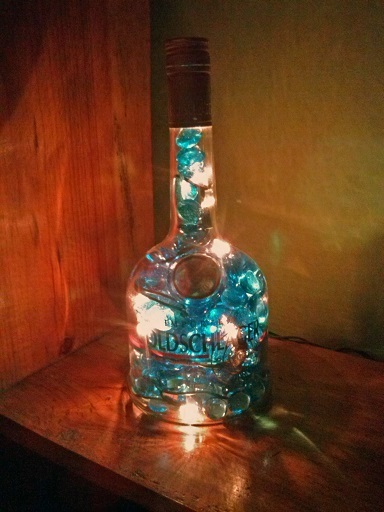 Just wanted to show you the bottle lamp I made. Thank you for the ideas. A bit of information about the bottle: Goldschalger originated in Switzerland but is now produced in Italy. The flecks of gold contained in the drink are said to create small tears in the tippler’s throat and stomach lining, thus assuring faster delivery to the bloodstream. Still, the human body wasn’t built to digest precious metals; therefore Goldschlager reduced the amount of gold in this liquor soon after its release due to alleged accounts of allergic reactions. We would like to thank Deyni for sharing her bottle with lights project with us. It looks like it’s sitting on a book shelf right now and will be enjoyed for quite awhile!